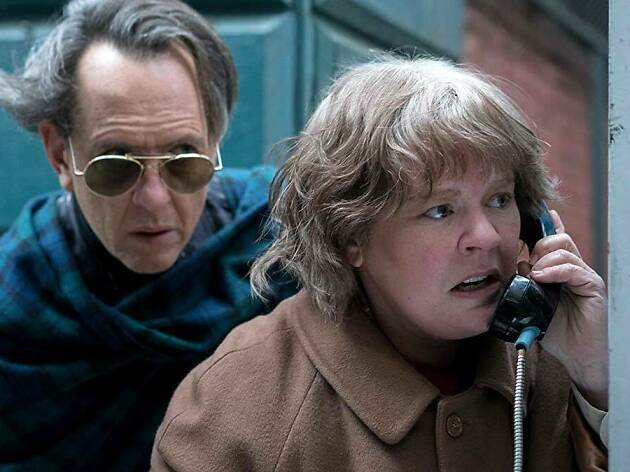 Two struggling souls come together to pull off a hoax on a world that’s rejected them, in this powerhouse showcase for Melissa McCarthy and Richard E. Grant. The specific New York City of 1991 – somehow harsher and more wintry, and still, a place of cozy antiquarian bookstores and down-on-their-luck dreamers in overcoats – comes to life in ‘Can You Ever Forgive Me?’, based on an actual literary misadventure. Paul Simon’s percolating, anxious ‘Can’t Run But’ dominates the movie’s soundtrack, and no number of scenes shot in Manhattan’s famous Julius’ bar, the whiskey flowing, can shake that restless mood. It’s atmosphere brewed to an expert degree of exactitude. With $14 in her wallet and a sad existence of sleeping in her clothes in a fly-infested apartment she can no longer afford, author Lee Israel (Melissa McCarthy, easing into a rich, quietly dramatic turn) has reached the end of the line. Bristly and abrasive, she can’t sell her fusty celebrity biographies anymore; she steals toilet paper from her agent’s swanky pad and pushes away her lonely dead-end reality. Your heart leaps when she meets a bitchy kindred spirit in Jack (Richard E. Grant, uncorking the performance of his career), also coasting on an air of borrowed time: another gay survivor who remembers when things were easier. Honestly, that would have been enough for a film, especially when it has acting this relaxed, a witty, sad script (adapted from the late Israel’s memoir by Nicole Holofcener and Jeff Whitty) and The Diary of a Teenage Girl’s Marielle Heller behind the camera directing. But the movie is also a literary-hoax thriller, a slightly busy one, with Lee learning how to turn her esoteric knowledge into cold hard cash by forging famous letters – purchasing old typewriters, browning stationery in ovens, etc – which Jack then fences. The cops close in but until then, as with ‘Six Degrees of Separation’, there’s a tricky sense of euphoria that comes with Lee’s self-delusional windfall. ‘It’s my writing,’ she insists, her pride rearing, completely lost in the ruse. As author Lee Israel, Melissa McCarthy shows it as it was in the early 1990s. Struggling to make a living, Ms. Israel turns to forgery by writing letters from celebrities such as Dorothy Parker and Noel Coward and palming them off as authentic. She is good at it and makes some money selling these. Richard E Grant plays an admirable down-at-heel dandy and their interesting relationship blossoms. Its pace is slow and the layers of the onion are gradually added until the information at the end of the film gives the final piece of the jigsaw. Great acting by two great actors. What a surprise for us to visit our local multiplex for an early afternoon showing and find the joint nearly full of eager watchers - unusual in our experience for an intelligent, low-key movie. 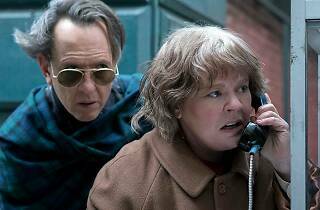 Maybe Oscar nominations for its two principals, Melissa McCarthy (best actress) and Richard E Grant (best supporting actor) had pulled in the punters? Whatever the reason, it was a delightful afternoon’s cinema concerning a couple of oddball characters - a failing writer and a posh English eccentric in an atmospheric '90s Manhattan setting. Both down on their luck, they find that forging ephemera in the form of letters mainly from Dorothy Parker but also from others including Noel Coward, are a lucrative but highly dodgy form of income. Wonderful chemistry from McCarthy and Grant as the ice tinkles in their glasses of Scotch on the rocks. Stylish film, fun atmosphere of early 90's New York, & great old fashioned soundtrack. Melissa McCarthy gives a straight performance (with a few witty lines), and the whole film is a thing of pleasure. My only reservation is that the tale is rather slim, and we know (almost) everything early on - so it doesn't really develop very much.